On April 6 th to 19 th 2020, the Arc de Triomphe in Paris will be wrapped by Christo with silver blue recyclable polypropylène fabric and red rope. This was decided by the French President Emmanuel Macron with Philippe Bélaval, head of the Centre des Monuments nationaux (which includes Arc de Triomphe) and Serge Lasvignes, President of Centre Pompidou, who discovered the project in Brussels in 2017 at the Christo retrospective. At the same time, the Pompidou center will host a large exhibition on Jeanne Claude and Christo’s projects in Paris where they lived together for seven years (1958-1964) and later, at the time of the wrapping of the Pont Neuf 1975-1985. 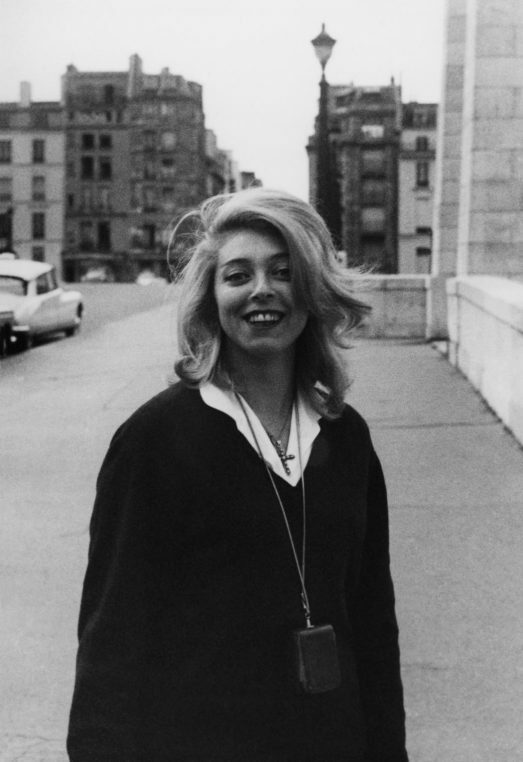 The couple met in 1958, in Paris, and lived there before moving to New York. Jeanne Claude de Guillebon grew up in Morocco and in France. 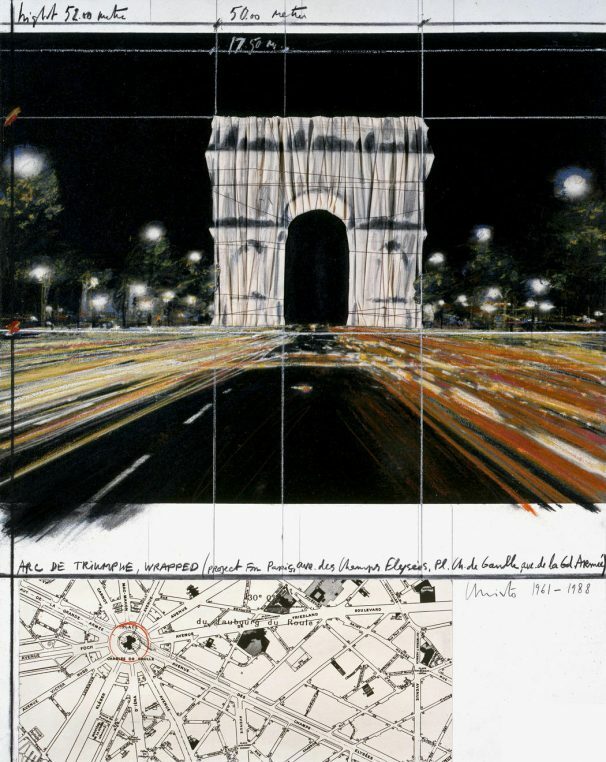 Christo had fled from Bulgaria and lived near the Arc de Triomphe, of which he had already done a photomontage in 1962, followed by sketches in 1970-1980. Laure Martin, who was his assistant on the Pont Neuf project, has been coordinating with Christo, for the last four years, the feasibility of the project and the exhibition at Centre Pompidou which is curated by Sophie Duplaix in close collaboration with the artist. Bernard Blistène, director of the Museum of Modern Art, was one of the first to be involved as early as 2015. The show will include all projects for Paris at the time, the “Wrapping of Ecole militaire” in 1961, the Arc de Triomphe in 1962, a “Wall of oil barrels-the Iron curtain rue Visconti” 1961-1962 (realized), “Wrapped statue place du Trocadero”, 1964, (realized), “Wrapped statue of Louis XIII, place des Vosges”, 1967, “112 oil barrels, Palais de Tokyo”, 1968, (realized), “Wrapped trees for Avenue des Champs Elysées et Rond-Point”, 1969, “Wrapped bridge, Project for Pont Alexandre III”, 1972 and all the projects for Pont Neuf wrapped, 1975-1985. At the time when the Gilets jaunes (yellow vests), have vandalized the Arc last December, Christo appears as the redemptor of the Champs Elysées. The Arc de Triomphe was commissioned by Napoléon to architect Jean- François Chalgrin in 1806, right after his victory at Austerlitz. It sits at the top of avenue des champs Elysées and is surrounded by 12 radiant avenues. Place de l’Etoile was named place Charles de Gaulle after the President’s death. Its dimensions of 50m in height and 45 m in width make it a focus point between the perspective of the Louvre and la Défense. It is devoted to the souvenir of revolutionary and Napoleonic soldiers and also houses the tomb of the WW1 unknown soldier. Since 1923, the Eternal Flame has been burning without interruption and this will go on during the 14 day installation. 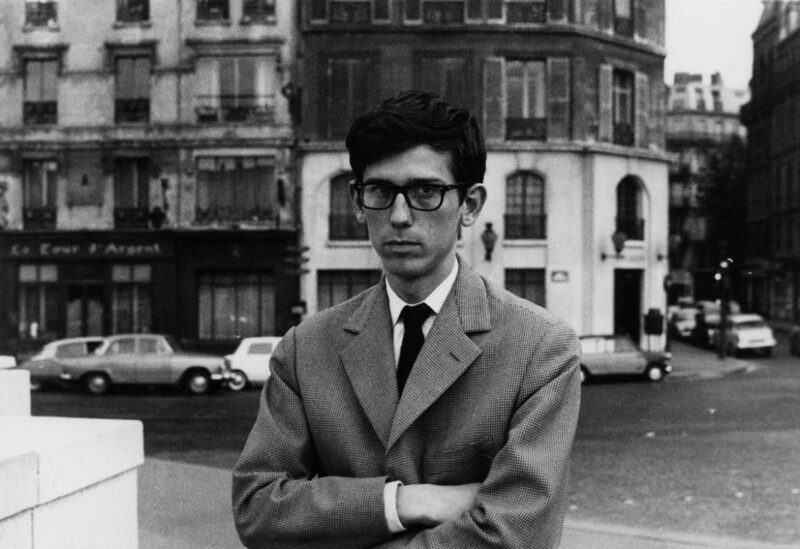 The project was discussed directly at the Elysées Palace and at Centre Pompidou, and the determined Philippe Bélaval, was instrumental in achieving this major coup. The wrapping is like all of Christo’s, entirely financed by the sales of his preparatory drawings. 25 000 square meters of silver blue fabric and 7 000 meters of red rope will be used. After Lake Iseo in June 2016, Christo shows that at 83, he is as determined as ever. This is a project he started sketches for in 1962 when he rented a tiny apartment near the Arc. 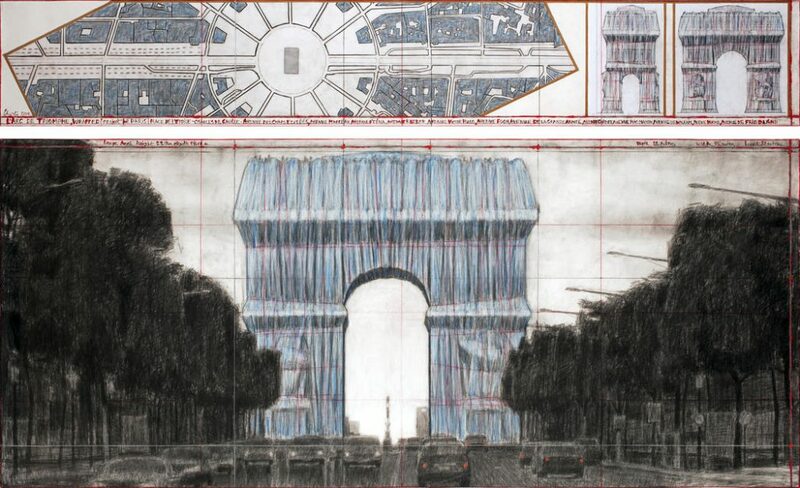 The historical symbolism of the Arc de Triomphe will be rejuvenated by Christo’s talent! This is a project to look forward to all year long and you better book your hotel immediately. 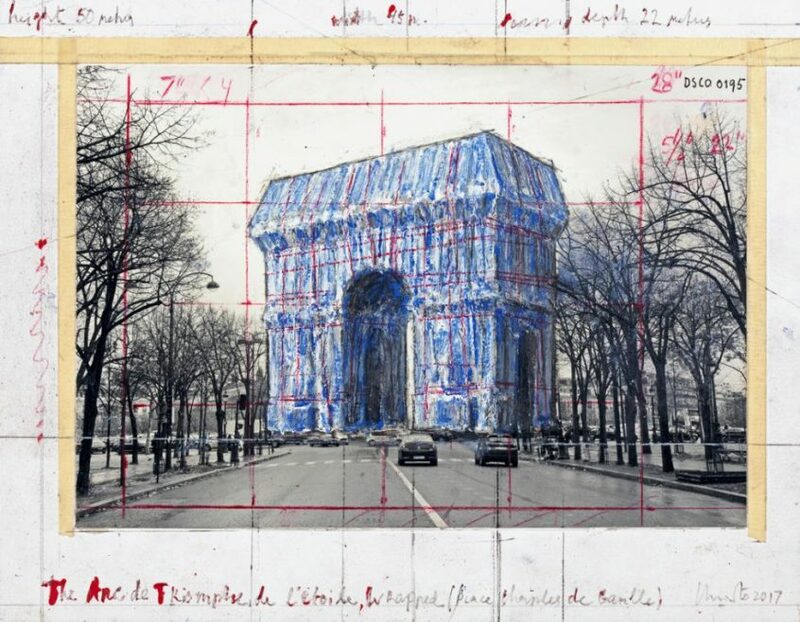 All of Christo’s followers will be merging towards Paris especially since this is taking place during the two weeks around Easter (on 12 April 2020)… Exhibition at Centre Pompidou from 18 th March to June 15. And an artist book, published by Jeanne Claude and Christo at the time, “Erreurs les plus fréquentes” (most frequent mistakes) can be acquired at Editions Janninck. 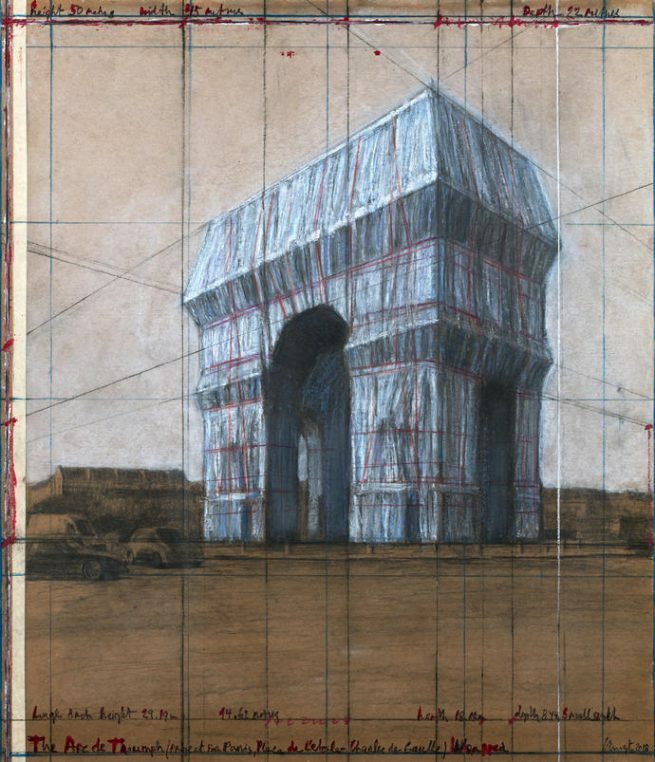 What a great announcement for Christo’s next project in Paris with the wrapped Arc de Triomphe! The next highlight after the exciting walk over the Lago d’Iseo! This will be beautiful. A shimmering Arc: like a vision, a spectre, an arc made of liquid suspended in air! Magnifique ! J’ai hâte de voir cela ! J’avais vu les bannières orange dans Central Park a New York et c’etait spectaculaire ! How exciting. Just back from Japan where amongst other beauties I saw the Toro gates in Kyoto which reminded me of Christo’s wonderful Orange gates in Central Park. Alors rendez-vous Pacques 2020. Can anybody please tell me when the actual wrapping starts? Arc de Triomphe wrapped is on view from 6 to 19th of april 2020. But is in those weeks the wrapping happening or is it finished then and you can view the work finished. I like to see the process evolving. Like I did when the Pont Neuf was being wrapped. Thank you for your answer, so kind. So I better come to Paris (I live in the Netherlands) in the beginning of April, see the last days of wrapping and then from the 6th of April on the project is finished and on view.